“Pós-tudo” is the name of a Brazilian concrete poem from 1984 by Augusto de Campos. A more or less literal translation would be: “I wanted to change everything / I changed everything / Now, post-everything / Ex-everything (I study) / I change (mute).” The last two lines have double meaning in Portuguese, shown in parentheses in the translation. I borrow the word “pós-tudo” from this poem to name my first collection of piano études. An étude (“study” in French, “estudo” in Portuguese) is typically a short composition designed to improve the skills of a performer by isolating and exploring a specific technical and musical challenge. In the case of my Pós-Tudos, this is true not only for the player, but also for myself as the composer. The “musical challenge” I set out to isolate and explore, from the point of view of creating the music, was musical borrowing. Musical Borrowing is a catch-all term used by musicologists to refer to a rich set of practices that involve the reuse of pre-existing music to create more music. This is stuff that, consciously and not, musicians have been doing for centuries. You may have heard of quotation, collage, plunderphonics, remix, parody, sampling, mash-up. Depending on who you talk to, you may also hear the words piracy and plagiarism. In all but one of the pieces you are going to hear tonight, I recycle and transform musical material borrowed from other composers. I use it in direct and indirect ways to shape each composition. Sometimes the étude travels far away from the source, rendering it totally unrecognizable. Other Pós-Tudos, however, blur the line between “original” composition and “mere” arrangement. How much is mine and how much is not? Does it matter? Playing “name that tune” games can be fun, but ultimately that’s not what these Pós-Tudos are about. Being completely unfamiliar with the musical sources is as much of a listening asset as being privy to them: both types of listening experiences will be unique and invaluable. More broadly, for me, the Pós-Tudos are part of an ongoing reflection on the malleability of musical materials, the tenuous concept of “originality”, and the practical need to move beyond intellectual property and to abolish private ownership of ideas. Finally, on a personal level, each Pós-Tudo was also a way for me to spend more time with pieces that I love, and rediscover them through many interesting new angles. Sources: Luiza by Tom Jobim (Pós-Tudo 1); Second movement of Ravel’s Piano Concerto in G (Pós-Tudo 2); Construção by Chico Buarque (Pós-Tudo 3); Étude Op. 10 Nr. 6 by Chopin (Pós-Tudo 4); A Ostra e o Vento by Chico Buarque (Pós-Tudo 5); No known sources for Pós-Tudo VI; My own Seis Vícios de Garlândia, 3rd movement (Pós-Tudo 7), Single Ladies by Beyoncé (Pós-Tudo 8), Rosa by Pixinguinha (Pós-Tudo 9), Lua Branca by Chiquinha Gonzaga (Pós-Tudo 10), Op. 27, Nr. 29 by Kabalevsky (Pós-Tudo 11), Menuet from Partita in D major by Bach (Pós-Tudo 12). 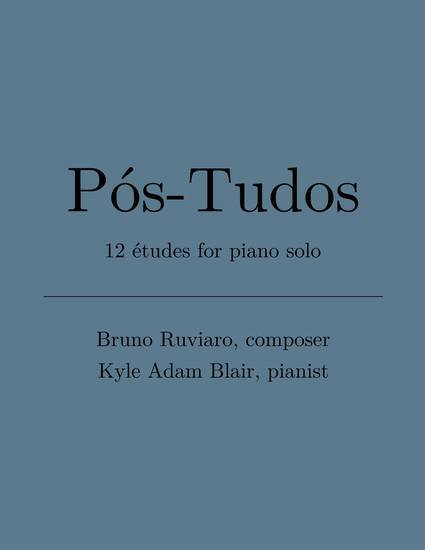 Premiered by Kyle Adam Blair on September 2, 2016, Center for New Music, San Francisco (except #8, #10, and #11, which to be premiered on January 19, 2017 at Santa Clara University).